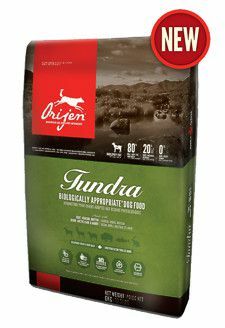 Orijen’s Tundra dog food is the newest addition to the Orijen family of trusted, grain-free nourishment for your pet. Tundra is made up of 80% meat/fish from goat, venison, mutton, bison, arctic char, rabbit, duck, trout, cod and pilchard. This surf and turf recipe combines lots of different ingredients together to make sure that your pet is getting a balanced diet. In fact, that is what each and every Orijen formula is all about! Complete and balanced nutrition the way that nature intended. Tundra is also a wholeprey diet, which means that the meat, organs, and cartilage are all used in the food. This helps meet all of your pets nutrition needs while eliminating the need for synthetic ingredients. In other words, it is nourishment in ratios that mimic Mother Nature. The other 20% of Orijen’s Tundra is made from locally grown fruits and vegetables. These ingredients are always fresh and delivered daily to ensure the best flavor. As with all Orijen dog food varieties there is 0% grain and potatoes, and no added water! We are stocking Orijen Tundra in 3 sizes: 4.4 lb, 13.2 lb and 25 lb bags. Trial sizes are also available for purchase so that you can be sure that your pet will like the new formula before buying a big bag.